“Shake” It Up: Will Baauer Bounce At Radio? Eh, close enough, but not quite. It’s exploded all over the Internet; in fact, your office may be next to upload a version on YouTube. One person is casually grooving to a funky-sounding song, and fifteen seconds in, a whole group of people are swaying to the beat in crazy costumes. In just thirty seconds, a viral sensation was born. Jimmy Fallon’s crew did it; so did Ryan Seacrest’s morning show. In fact, various versions have been popping up over the last two weeks, but it’s turned into a phenomenon over the last four or five days, totaling thousands of separate videos. It’s based off of the song “Harlem Shake”, credited to a 23-year-old producer from New York whose real name is Harry Rodrigues, but who goes by the stage name Baauer. It originally was released last spring but went largely unnoticed outside of a few compilation albums featuring mainly underground material. Now, it’s suddenly been rediscovered by millions of people watching all over the world, ready to boogie down to the infectious beat of the song and laugh a little bit at people’s creativity when it comes to making an Internet video. In the States, Baauer is on Mad Decent Records, a company started by the producer Diplo, and its sub-label Jeffrees. He’s also signed to LuckyMe Records, a small company based out of the United Kingdom, where an EP of his is in production and will be out later this year. The song isn’t his first official release (a song called “Dum Dum” was issued last year) but it is the rising star’s first song to get some attention and in a big way. The song is obviously a hit at retail. “Harlem Shake” is now #3 on iTunes in the United States, as well as in the United Kingdom. (Look for a top 5 placing on the U.K. Singles Chart this weekend, which is purely sales-based.) It’s also #2 in Canada and #1 in Australia. Yet, with every huge song to come off of YouTube, there also a few problems associated with it. First of all, it’s a viral hit and a novelty song all rolled into one. I mean, we just got over PSY‘s “Gangnam Style” recently, do we really need another one of these singles to blow up? It’s certainly not going to be easy following a music video that has over 1.3 billion hits on the web. Yet, they are two different songs incorporating two different styles of music. I guess we have no choice. The song’s already doomed to have a short shelf life, so we may as well enjoy it while it lasts and of course, prepare a spot for “Harlem” and Baauer on the list of the biggest one-hit wonders of all-time. Then, there’s the composition itself. It’s a grimey-sounding record that’s largely instrumental in nature despite the “do the harlem shake” line and a few sound effects. Plus, people generally only know it from the first thirty seconds of the song; why would they be inclined to listen to the whole thing? That’s going to really hurt it, especially in leading into my last point. The last fully instrumental single to make the top 40 at CHR was “Sandstorm” by Darude in 2001. We’ve also had singles crossover from Europe to the States that are largely instrumental, but have a limited vocal in either a foreign or nonsensical language, like 2005’s “Axel F” by Crazy Frog and 2011’s “We No Speak Americano” by Yolanda Be Cool & DCUP. The thing is, neither of those three songs have made it out of the 30’s at this specific format despite a decent pace at retail. “Harlem Shake”, which is far bigger sales hit than any of these were, could likely do the same if the trend dies down faster than we think. Lastly, as I began to explain, there’s the issue of radio. It’s not accumulating airplay very quickly here in the States, possibly because it hasn’t officially been serviced yet. It’s also on a really small label, so it would need to be picked up by a major one in order to get the proper promotion. The leader thus far at top-40 radio is WNOW-FM in New York City, with nine detections recorded in the past few days, followed by KHTT-FM/Tulsa and KSXY/Santa Rosa, CA with six, with additional small airplay in cities like Los Angeles, Miami, Nashville, Philadelphia, San Diego and Washington, DC. With all the electronic dance music on playlists at the format, it probably won’t struggle to fit in on the airwaves, but a #56 placing on the Hot 100 isn’t going to cut it when “Gangnam” just went to #2 for a month and a half on the Hot 100. Whatever you may think of the song, it’s going to be around for a while and pushed to the point where you can’t stand it any longer. 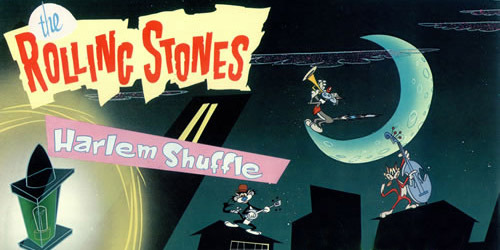 Hey, we could always have a rerelease of the “Harlem Shuffle” to counter it, couldn’t we? Let me know what you think of the song and the trend based off of it in the comments or on Twitter: @AdamFSoybel.